School counseling and education are getting more and more attention from influential technology companies. From startups to the Google mothership, companies are reallocating their funds to support our efforts. This is wonderful news because innovative tools are becoming available to educators to support us helping students. There is a downside though…some educators are afraid. As a school counselor and blogger, I write about and use technology copiously. It makes my job easier, more efficient, and allows me to spend more time with students. However, when talking with other school counselors and educators about a new tech tool, they often look at me like I am asking them to learn Greek. People tell me (metaphoric) things like, “I want to go to Athens and interact naturally with the people there, order an authentic gyro, and book a bus ride into the countryside—but I want to do it all in English or I am not going.” The world of learning tech isn’t an all or nothing environment. You don’t have to dive all the way in, but to learn anything new you do need to get wet. Stick your toes in, wade up to your knees, test the waters. All of those things will require a towel after you are done. Have you ever started a new workout plan? Trained for a triathalon? Prepared a Thanksgiving dinner? If you found success in any of those events, you likely didn’t wing it. You created a plan, made action steps and targets to reach at given intervals to determine how you were progressing. The same is required for tackling a new tech tool. Here is an example. Imagine you wanted to start using Twitter as a school counselor or educator. Like any plan, start with the end in mind. What would you like out of your Twitter usage? Perhaps you are looking for an expanded Personal Learning Network (PLN) or to bolster communication opportunities with parents or students. I like using S.M.A.R.T. goals, but this process can also be more informal if you wish. This end result (or first stepping stone) will help define your next steps. Now, let’s imagine you wanted to expand your PLN. How can Twitter help with that and what do you need to know to tap into that resource? Unsurprisingly, you may not know the answers. Luckily, those same tech giants (and their minions) have created a large pool of resources that is easily accessible. Some of my favorite go-to’s are YouTube and Google (try searching “Twitter for educators” or “Twitter PLN” in YouTube or Google and exploring some of those results to start). My blog, The Counseling Geek, as well as many of my colleagues’ blogs (SCOPE by Dr. Erin Mason, School Counselor Blog by Danielle Schultz, and The Middle School Counselor by Carol Miller are some great ones!) are wonderful places to explore technology specific to school counseling. I, personally, have learned guitar, gourmet cooking, graphic and web design, marketing, light coding, and more all because of YouTube and tutorials curated from around the web. This self-teaching does require some bravery and a growth mindset. Many colleagues I teach or talk to use the words, “I just don’t understand technology”, “I think technology hates me,” or “I just don’t know what to do.” These are all valid views, but they close the door to learning. What would you ask a student to do in the same situation? I know we would ask them to use their resources, try again a different way, scaffold their learning, or ask a friend for support. But, as adults, we tend to freeze and not move forward. I wrote more about this in a short blog post called Be Brave. Once you have familiarized yourself with Twitter (most tools also have excellent help and FAQ sections of their websites if you still need some answers), it’s time to apply what you’ve learned. Just like with the workout metaphor above, the first thing to remember is that tech tools usually do not bear fruit right away. You will not typically see immediate results, just like that six pack will not magically appear after doing 200 crunches. But, just as your abs are getting stronger with each day, the same thing happens to your tech skills. When you dedicate time to a tool you are building your tech muscles. Please don’t give up after a few days (or even weeks) but try consistently for a few months. Start by following some key Twitter accounts (myself and all the bloggers above are active on Twitter and you can access our accounts through our blogs) and do what is called “lurking” or just watch. For your reference, the main school counselor hashtag (#) is #scchat (school counselor chat), but you can “lurk” with just about anything. These steps can apply to other tools too. Using Google Drive for the first time? Create a new folder or document and play around. Share the file with your personal email and see what happens. Working with Naviance? Create a test student and see what the student experience is like. Most of these tools will not break things, so go ahead and play around. My own biggest learning leaps have been from following tutorials I have found online and tweaking them to be my own. Children learn by trial and error – you can too! Don’t be discouraged if you find things are not catching on as you expected. 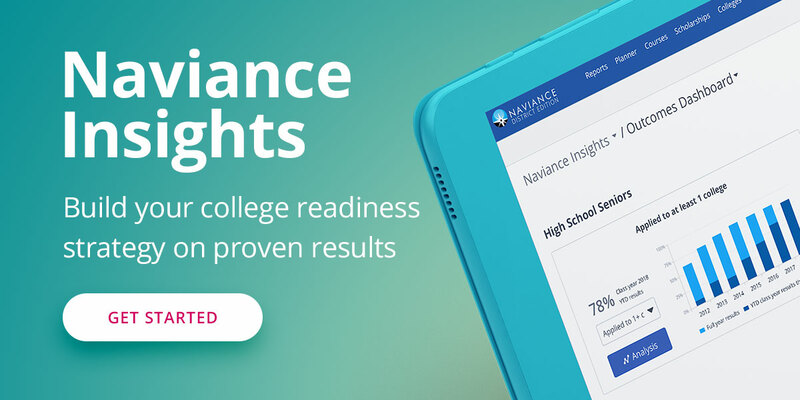 My first year (or two) with Naviance took some persistence and educating of students, staff and parents about the tools that are found within Family Connection. The same steps of learning technology will be experienced by your parents, staff and students when you work on implementing a new tool, so help them through the process. So you have jumped into the tech pool and are totally immersed now. That rocks! How are your job, outlook, time, funds, or processes different because of it? After implementing any new tool you should examine and refine your usage. If it caught on and is going well, what else can you do to increase its effectiveness? If it didn’t catch on as expected, reexamine your efforts. Did you miss a step? Can you use it in a different way? What other roadblocks could there be? If you have given yourself adequate time, energy and effort and things still aren’t going well, sometimes you actually do need to “cut bait” and start over or try something different. That is normal and not bad but it can feel defeating. Luckily for us there are many, many different tools out in the tech world to use as school counselors, and if one is just not sticking for you don’t throw in the towel and give up. Pick something new and keep growing. Learning is not something you only do once. One of the best professional growth opportunities for school counselors each year is the American School Counselor Association (ASCA) National Conference. This happens in early July each summer and thousands of school counselors come together from around the world to learn from leaders in the school counseling profession. There are an increasingly large number of topics revolving around technology use in our field each year. Funding is often a challenge for school counselors seeking to attend the ASCA conference during the summer. In 2012, I started the School Counselor Community Scholarship (SCCS) to help school counselors access the ASCA conference each summer. Carol Miller of The Middle School Counselor has also partnered with me to grow SCCS over the past several years. Funds for the annual scholarship are raised from April to December through individual donations from school counselors and like-minded businesses, such as Hobsons who has sponsored a school counselor in multiple years running. In January each year the scholarship application opens for school counselors and graduate students to request funding to cover conference registration fees. In the four years, the SCCS scholarship has helped 17 school counselors with over $5,000 in donations. Please be sure to bookmark the scholarship page and apply in January when the application opens. We also seek donations and business sponsorships throughout the year. The link below has the donation information and will house the application once it is available. We hope you apply and thank you for supporting school counselors. As you start your journey to becoming the next geek, please keep your head up. Remember, it is a process not an event. You are already awesome…you are a school counselor! But, armed with technology, you are about to get awesome-er. Jeff Ream is a school counselor at North Tahoe High School, a board member with the California Association of School Counselors, a blogger at The Counseling Geek, founder of the School Counselor Community Scholarship, and speaks around the country.